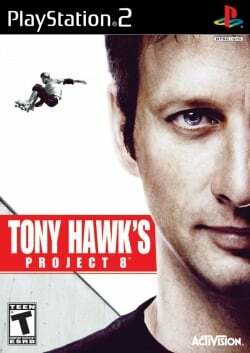 Game description: Reengineered from the ground up, Tony Hawk's Project 8 immerses players in the definitive skateboarding experience using ultra-realistic graphics, enhanced physics and responsive controls that simulate the feeling of skating with every trick and bail. The game challenges players to experience the intensity and pressure of skating against some of the world's top pros in true to life competitions as they aim to become the #1 skater. In-game is a mess. Using GSdx in Software mode cleans it up, but still has many missing environment graphics. USA v02.20(10/02/2006), EE/VU Rounding: Negatives*, Missing somethings and minor issues in hardware mode,Software mode fixes practilly all. Description: Certain textures would not load correctly under regular gameplay. Description: Translucent flag like texture covers the whole screen in game. Workaround: Enable HW Hacks then go into the configure and set the "Skipdraw" to 15. Also using "Nearest" round mode VU setting as suggested by others above. This page was last edited on 13 April 2018, at 22:28.